Did you know nearly 12,000 Americans die of skin cancer each year? Up to 95 percent of those deaths are preventable with early detection and action. "We want to slash the number of avoidable skin cancer deaths in half by 2020 with HÜD," says Dr. Alexander Börve, CEO of First Derm, which powers the medical-grade device. A dermatoscope is a lens that dermatologists use to determine if a mole is cancerous or benign. Until now, this cutting-edge tool has been too expensive and too difficult for the average consumer to access. 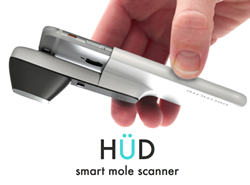 HÜD is the first-ever dermatoscope designed for consumers. The device attaches to any smartphone’s camera and captures medical-grade images of suspicious spots, equivalent to those generated in a doctor’s office. When used in conjunction with First Derm’s app, HÜD allows users to remotely evaluate potentially deadly skin cancer lesions. “We’re empowering the consumer to take proactive steps towards early detection of skin cancer with the power of mobile technology,” says Dr. Alexander Börve, CEO of First Derm and mobile health technology leader. Börve’s six years of clinical research, combined with Dermlite’s nearly two decades of hardware refinement yield the technology behind HÜD. The new product is a joint venture, which allows First Derm’s app users to accurately track moles with images and share suspicious ones with a dermatologist for evaluation. The Indiegogo campaign launches today and perks include: behind-the-scenes insider access, a meet-and-greet with the design team and early bird pricing. HÜD is expected to retail for $79.99, but the team is offering an early bird price of $65 for the first 50 devices sold on Indiegogo. First Derm leads the revolution in mobile health. The unique app empowers users worldwide to anonymously submit photos and descriptions of skin ailments to board-certified dermatologists. Within 24 hours, First Derm dermatologists respond with 1) the likely identity of the skin problem, 2) at-home treatment options and 3) if or when a doctor’s visit is recommended. Since the app can be accessed at any time, users receive feedback on ailments from a board-certified dermatologist, even on holidays and weekends. The app and parent company, iDoc24 Inc. are headquartered in San Francisco. First Derm is available for free download on both IOS and Android. Dermlite (3Gen, Inc.), a privately-held company headquartered in San Juan Capistrano (about 90 km south of Los Angeles), with satellite offices in Houston, Texas and Sierra Madre, California, designs and markets the world’s leading dermatoscopes under the DermLite® brand. Dermatoscopes are a diagnostic tool for skin cancer screening, giving dermatologists a magnified, illuminated view of skin lesions.